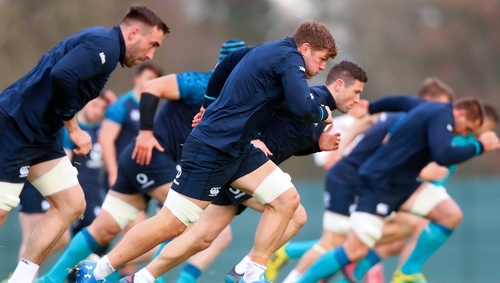 The Six Nations is coming in the spring and it's unlikely Joe Schmidt will be doing too much chopping and changing with regard to his World Cup squad. So the game against the USA is the last chance to make a lasting impression for so many. The Irish players will know there is no room for error. You could play yourself out of contention with a bad performance. They'll be no holding back, no wrapping up the season with a nice, easy game. Niall Scannell gets his chance tomorrow - there are four hookers in the squad, but only three will go to Japan. He knows himself if it goes bad for him that's it. There are lots of guys in that situation especially in the props. In the back-row, competition is off the charts. All in all, not good news for the USA. That said, this is probably one of the better US teams for a while in spite of the logistical problems in getting them together for training. There are ten players starting who play their rugby professionally overseas and another five on the bench. And that's pretty much as good as it gets for America. When I was there we were looking at four or five maximum. It's a strong USA team and they've beaten Scotland and Samoa in the last year. They will know that they are facing an Irish team who have lot to prove and don't be surprised that they will throw everything at us early on. If that thrust turns out to be the difference in the end, it will be seen as the Irish lads not playing well as distinct from the USA playing really well. I think it will be a difficult evening for the visitors. Eddie O'Sullivan was speaking on RTÉ Radio 1's Morning Ireland.